We decided to do this project due to our keen interest in the robotics. We were also looking for a project that involved a perfect mix of hardware and software complexity. This project enabled us to use new hardware such as sensors, stepper motors and their integration in big projects. The robot is essentially a vehicle propelled by two stepper motors. It uses IR sensors for detection of obstacles and also to keep track of its current position. The details of how this is done are given later on in the documentation. 1.Keeping track of how much the robot had moved - this was not as simple as counting the steps of the stepper motor because there was considerable loss of traction and as a result slipping of the wheels. 2.The second problem was the robot not moving in a straight line � this was expected as the mechanical fabrication of the robot was ordinary to say the least. This is how we took care of the problems - problem one was dealt with by making the robot move on a grid and counting the lines as we crossed them. Problem two was dealt by using the same grid, but using the lines to realign the robot. So this is what we had to do - make the robot move from one coordinate on a grid to another, such that it sucessfully avoids obstacles in the way. The typical operation scenario is shown above. Stepper Motors (2 in Number) - the motors used here are the mono-polar type. Op � Amps (3in Number) � for amplification of the sensor signal. 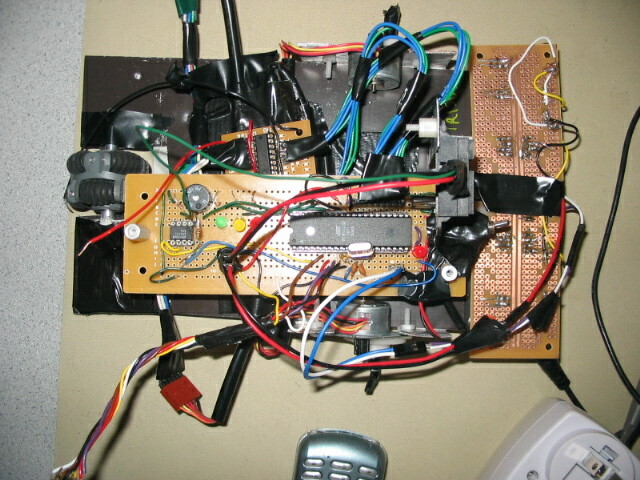 Misc � Resistors, capacitors, 16MHz oscillator, piezoelectric speaker, wires etc. 2 inch aluminum standoffs and locks to hold the board. Misc � screws, bolts, hot glue , duct tape etc. Mechanical fabrication to create something that moves around was a challenge that had to be dealt with considerable effort. A steel plate of 20x13 cm was taken and a notch of about 2.5x3 cm was cut on one of the sides to accommodate the omni-wheel. Next shafts were hack-sawed and secured in place with the help of hot glue and some tape with the gears and wheels in place. The design is shown below with the bottom view and the side view. Apart from the design shown above, two holes were drilled in the front of the robot and three random holes to mount our circuit board using aluminum standoffs. The electric design was more of a challenge simply because we had a lot of things being interfaced with the MCU at once. To this end we followed a very systematic approach towards our project and interfaced every thing one at a time. Providing final software touches right at the end. Most of the electrical work was debugging of the board and the sensors. 1. Sharp GP2D12 � This range finder is one of the most commonly used in autonomous robotics applications for hobbyists and also in academic research. The reasons for this are essentially its low price, its compact (~40x14x13mm) and lightweight package. The GP2D12 is based on the triangulation principle with a collimated infrared LED for the emitting element and a PSD (Position Sensing Device) which constitutes the receiver. The main motivation for this choice is that the digital version is almost twice slower than the GP2D12 ( update period about 75ms against 40ms for the analog version ). Table 1 gives a brief overview of the GP2D12 specifications. The Sharp GP2D12 was used primarily for distance sensing. Output of the sensor was fed into an OPAMP with a gain of 1.5 � this gives a high level TTL signal for a distance of about 7 inches which is what we need for obstacle detection. 2. Fairchild QRB1114 - consists of a infrared emitting diode and an NPN silicon phototransistor mounted side by side on a converting optical axis in a black plastic housing. The phototransistor responds to radiation from the emitting diode only when a reflective object passes within its field of view. The area of the optimum response approximates a circle of .200 inch in diameter. 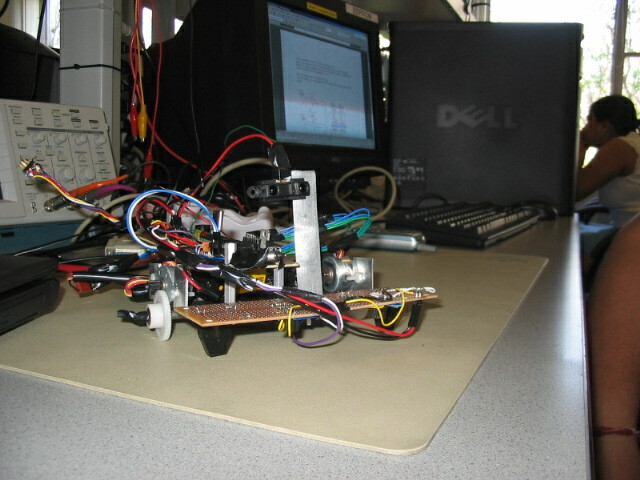 Two QRB1114 sensors were used to detect black and white parts of the track and was the sense to navigate and align the robot. Their operation was critical because they compensated for the lack of mechanical performance of the robot. 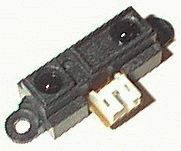 The output from the Sensor was fed to an OPAMP with a gain of 2 � this gave a TTL high for white and a low for black, making the sensing of the lines possible. This gives a good outline of all the hardware used in our Robot. Designing software for this project was completely new experience. We did not use any of the components in previous projects so interfacing them with software was difficult. To achieve the software goals we moved in steps along with the hardware we built. Software design can be broken into four sections as stepper motor control, line-sensing unit, obstacle detection and avoidance, path calculation. 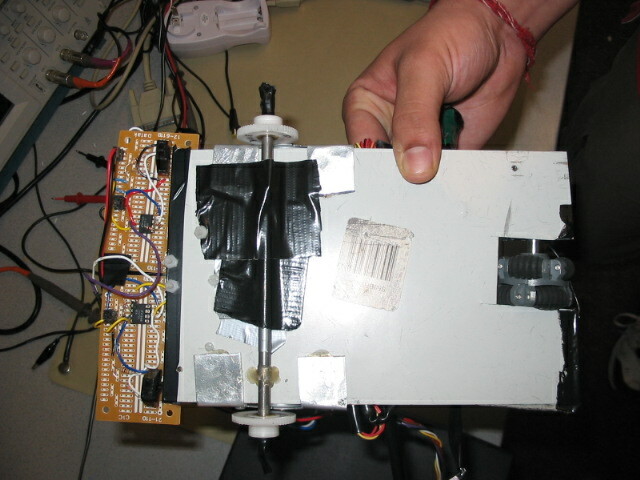 Stepper motor control was very straightforward. We started with a small program generating pulses in required sequence. After successful execution of this program we moved motors in such a way that robot can move forward, backward and can turn left, right. To move forward both motors move in forward direction whereas to move backward both motors move in backward direction. To take turns we need to turn motors in opposite directions. For line sensing unit we used to phototransistors, which were placed near front wheels. They can sense black line and its detection are used to keep track of the distance. Whenever robot identifies a black line, it increments distance in X or Y direction depending on its current orientation. We keep track of the orientation on every turn we take. Robot can have plusX , minusX , plusY and minusY as its orientation. This orientation is initialized in plusX direction. One more important use of these sensors is to realign robot. Due to slippage of wheels due to traction robot loses its alignment during the course of navigation. Whenever single sensor sense a black line, it turns robot in such a way that robot realigns itself. This step is very important because if we lose our alignment all our distance measurements will no longer be valid with respect to the starting position. We used distance sensor to find the obstacles placed in robot's way. Whenever state machine is executed we check for an obstacle. If there is an obstacle it takes turn depending upon the final destination and orients itself. We also keep track of previously identified obstacles as history so that they can be used if robot comes to the same position again. In this case we take it to some random place and start ultimate navigation. Path calculation employs simple method of moving in short goals. 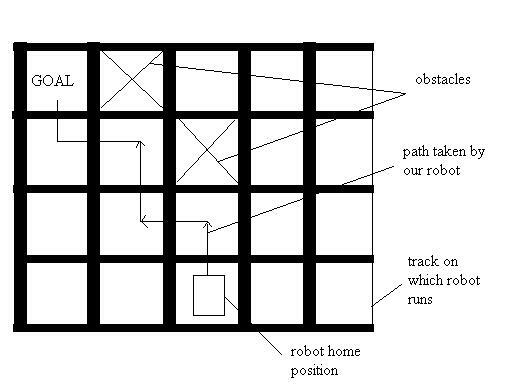 If no obstacle is present, robot moves in X direction till it matches with X co-ordinate of the destination and then it takes left or right turn depending upon the Y co-ordinate of the destination. Now in presence of obstacles first it will try to go along the normal path and when obstacle is identified it takes turn and tries to make to the co-ordinate of the destination in current orientation. 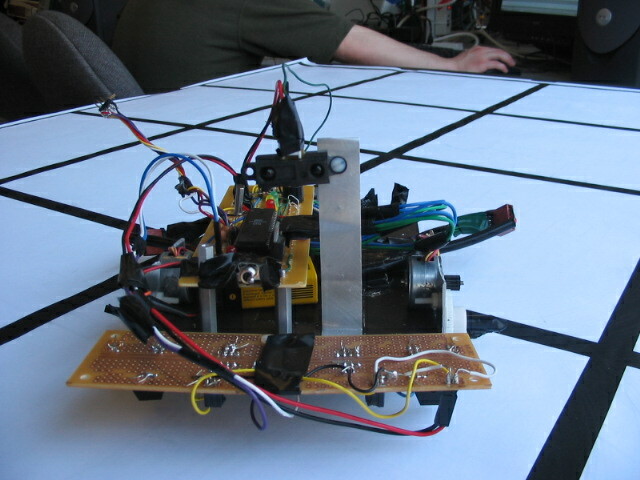 Constraints : To handle L-shaped obstacles robot keeps track of obstacles that came in its way in previous attempts. We used only two history flags in this project due to small grid, so whenever more than obstacles are placed next to each other in robot's path it oscillates between those. Number of history flags can be increased easily depending upon the size of the grid and user interest. if ( currentx == xfinal ) //if you have covered the x coordinate ..
We think we achieved what we set out to achieve and we are also very satisfied with the way our robot runs and navigates. The robot works according to the specification that we have set for it and in most cases � lands at the destination with the shortest path. All in all it was a very satisfying project for us and we enjoyed thoroughly. We would like to thank Prof. Land and the TAs for 476 for all the help rendered. We would also like to acknowledge the team Intellibot from where we took the ideas for driving stepper motors and robot design. 1. We accept responsibility in making engineering decisions consistent with the safety, health and welfare of the public. Our project objective does not contradict this goal. 2. Our work was consistent with the spirit of improving the understanding of technology. This project has been a great learning experience. It was immensely enjoyable with lots of intellectual satisfaction. We understood our limitations in Analog Design, and appreciated the fact that people have designed and commercialised very useful analog circuits. 3. We will strive to maintain and improve our technical competence and to undertake technological tasks for others only if qualified by training or experience, or after full disclosure of pertinent limitations. Our project decision described in the Summary section proves that we did not venture into a field in which we lacked expertise, namely Kalman filtering. We accepted our limitations in Analog Design, and used commercial sensors. 4. We will seek, accept, and offer honest criticism of technical work, acknowledge and correct errors, and credit properly the contributions of others. We sought the advice of Professor Land and our class-mats while encountering different problems, while offering our own opinion to fellow students in their undertakings. 5. We will treat fairly all persons regardless of such factors as race, religion, gender, disability, age, or national origin. Our project will definitely excite a person regardless of his caste, colour , or creed.